As I have written before, it is one thing to say a food or product is good for you. It's another thing to eat the level required. 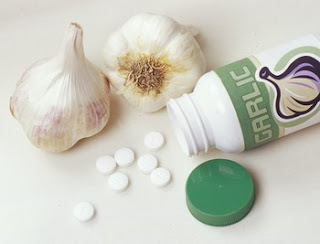 Today we look at garlic oil and grape seed extract. Garlic oil protected rat brains from nitrates that are found in preserved meats. Sounds good to me. However the level of garlic was 5 ml / kg of body weight. So for a 100kg human that would be 500ml of garlic oil/extract. Now suddenly the study doesn't look very promising - are you going to drink two full glasses of garlic oil extract a day??? I think not. However on the flip side the nitrate levels feed to the rats were 80 mg / kg of body weight. So again the same average 100 kg person would need to eat 8 000 mg or 8 grams of nitrate. Now what level does this mean. Taking the maximum nitrate level allowed in the US is 1 pound per 100 pounds of dry cured meat. Converting this into grams and applying the maths, this results in having to eat 750 grams of meat to obtain the 8 grams of nitrate. Clearly this is a very high level. However assuming the dose effects were linear...... if had 75 grams of bacon or other nitrated meat, which is not unreasonable as 100 grams is standard meat portion in a meal. This is a reduction of a factor of 10. Therefore 50 mls of the garlic oil extract would be taken. Even 50 mls is a huge amount of oil, that is almost 6 tablespoons of oil. Gross!!!! OK so we can safely say that people are not going to eat enough garlic or garlic extracts to obtain the benefits. This is good news, but what level was the GSE? It was 1 % of the diet. Apparently we eat about 2 kg of food a day. Thus 1% would be 20 grams, which would be quite a large supplement tablet!! Tablets typical range from 100 mg to 300 mg. So to obtain 20 grams of GSE you would need to take between 200 to 70 tablets.